Looking for a luxury 4 star break in the heart of the beautiful Scottish countryside? With a Kingsmills Hotel voucher you can enjoy all the romance and adventure of the Scottish Highlands within just a 20 minute drive of Inverness – all for a bargain price. Whether you want to recharge your batteries or enjoy a romantic weekend away, Kingsmills Hotel voucher codes will help you make big savings when you book. A stunning historic building on the outskirts of Inverness, the Kingsmills Hotel is the sort of place that everyone dreams about when imagining a luxury hotel in the Scottish Highlands. 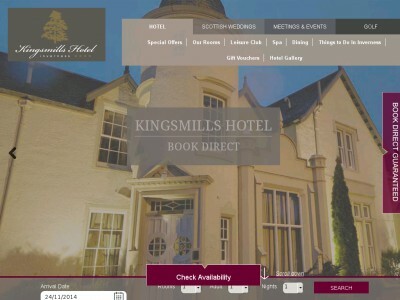 Offering 4 star comfort in a rural location just 20 minutes from the heart of Inverness, Kingsmills Hotel offers guests the best of both worlds. They can enjoy traditional country pursuits such as hiking and shooting, or explore the rich culture and fascinating history of the compact yet bustling city. Kingsmills Hotel is a luxurious haven for guests, offering warm fires, opulent bedrooms and fine dining in a beautiful mansion house. Guests can choose from 134 spacious bedrooms, many of which boast private balconies with stunning views of the hotel's manicured gardens and the adjacent Inverness Golf Club. As well as rooms in the mansion itself there are a selection of rooms in the exclusive Kingsclub retreat where guests can really relax and get away from it all. There is a spa offering a wide range of pampering treatments and therapies to help guests totally de-stress from the pressures of modern life, and a fantastic restaurant serving the very best traditional Scottish cuisine with a modern twist. In Inverness itself, guests will find a wide variety of attractions just waiting to be explored, from the historic castle to the famous mysteries of nearby Loch Ness. The Scottish Highlands have long been on most people's 'bucket lists', and it's easy to see why – from soaring mountains and rolling hills to secluded valleys and dramatic coastlines, you can find something new and exciting to explore every day of your visit. Whether you like to spend your time bagging Munroes, hiking through wild and beautiful landscapes or soaking up the culture of a new and exciting city, Inverness and Kingsmills Hotel have something to offer everyone. Planning a wedding or a conference? Kingsmills Hotel is well equipped to cater for anything from a small business meeting to a large celebration for hundreds of guests in a choice of private rooms. For weddings, traditional elements such as Scotch pipers and traditional music can be incorporated, while business events can benefit from excellent catering options courtesy of the hotel. Want to book a stay with Kingsmills Hotel? With a Kingsmills Hotel voucher you can enjoy fantastic savings on your stay. Whether it's a romantic break for two or a well-earned relaxing spa break with friends, Kingsmills Hotel vouchers will help you save the pennies. Browse our website until you find a Kingsmills Hotel voucher that suits you, then navigate to the Kingsmills Hotel online shop to book your stay. Enter your desired dates and room requirements and click 'Search'. Enter your Kingsmills Hotel discount code where applicable. Have you enjoyed booking a bargain break at Kingsmills Hotel? Why not find excellent places to eat locally with TripAdvisor or treat yourself to some great activities during your stay with lastminute.com? Or, if those aren't up your street, you'll find plenty more stores to browse in our Travel section. Shopping in the Travel category and want to redeem nice discounts? couporando.co.uk is precisely for you! Discover plenty of coupons and voucher codes for the most popular online stores such as Booking.com, Expedia, LateRooms and many more. Navigate to the Kingsmills Hotel online shop to book your stay. Enter your Kingsmills Hotel voucher where applicable. Choose a rate and click 'View available rooms'. Choose a room and click 'Select'. Enter your personal and payment details and click 'Confirm reservation'. Need to contact the team at Kingsmills Hotel? Whether you have a question about your booking, want to find out more about what's available during your stay or simply want to know how you could make big savings with Kingsmills Hotel voucher codes, you can contact the Customer Services department by telephoning 01463 237 166. Want to find out more about what's happening at Kingsmills Hotel? The hotel maintains a profile across all the major social media platforms. Follow them for access to lots of exclusive content including special offers, details on upcoming events, competitions and more. You can also use these pages to find out more about saving money with Kingsmills Hotel vouchers. Don’t forget to check them regularly, as you can never be sure when a free Kingsmills Hotel voucher might be waiting for you! Buy now online at www.kingsmillshotel.com. My husband and I wanted a romantic break in Scotland, and were thrilled when a friend recommended using a Kingsmills Hotel voucher for a luxury break near Inverness. The hotel boasts comfortable rooms, gourmet dining and excellent facilities in a rural location – and you can get great rates with Kingsmills hotel voucher codes. We used our Kingsmills Hotel vouchers to book a deluxe room on kingsmillshotel.com and had an unforgettable weekend unwinding in the spa and exploring the area. So why not treat yourself with a Kingsmills Hotel discount code?